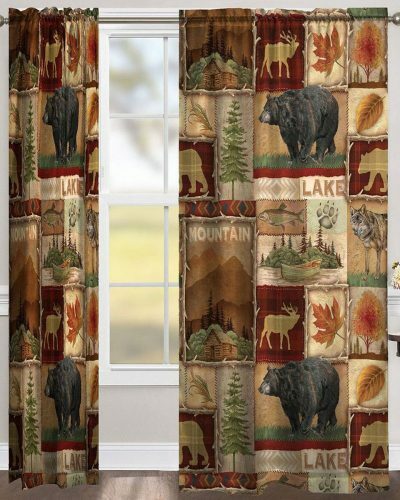 Bear curtains are popular for North Woods, lakeside, western and mountain lodge country home décors. Why the fascination with bears? The bear remains an interesting wild animal that we see occasionally in the wild, and every sighting is a thrill for anyone who is lucky enough to see a bear. Black bears are found in many parts of the U.S. and grizzlies and brown bears are found in other regions. For many of us, bears are part of the mystique of the outdoors. They are a real part of being outdoors, but we also use whimsical bears in our curtains for windows and our home decors. For example, if you have ever visited Gatlinburg, Tennessee, you have most certainly seen the cute chain saw carved black bears that are sold there. You can use them inside or outside on a porch or deck. And if you stayed in a cabin in Pigeon Forge or Gatlinburg, you certainly found a number of bears used in the décor. You’ve probably also seen cute black bears on kitchen accessories and bathroom accessories. And don’t forget to consider using bear curtains in one or more of your rustic cabin rooms. 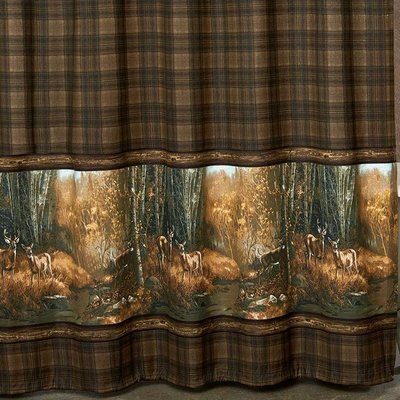 Bear curtains will liven up any room. This pretty set uses neutral colors from Nature. 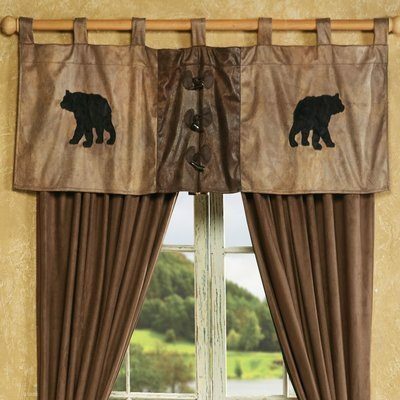 Rustic bear curtains can be used in any room of your house. 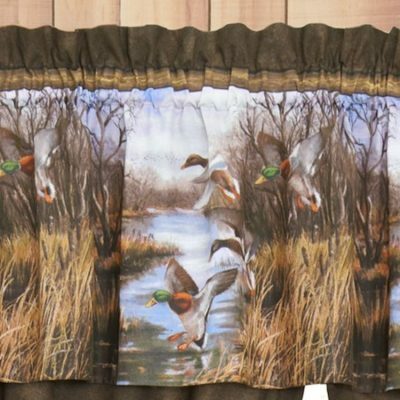 They are available in long curtains that block out the light for sleeping. You’ll find attractive curtains for windows in the living area, and some have embroidered or printed valances with bears on them. And, of course, there are light cotton rustic window treatments with bears that work well in the bath or kitchen. Moose curtains are a popular way to give your log cabin home a rustic décor with personality. 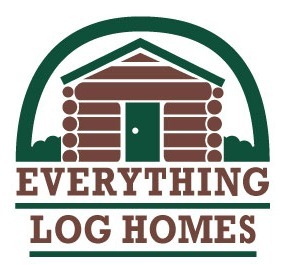 They work equally well with a country cabin by the lake or a mountain timber frame lodge. In fact, you can use the moose theme in one room or in every room of your house. There are cute country curtains with moose for the bedroom. And, if you like to have coordinated bedroom sets, you can often buy a comforter bedding set with rustic curtains to match. 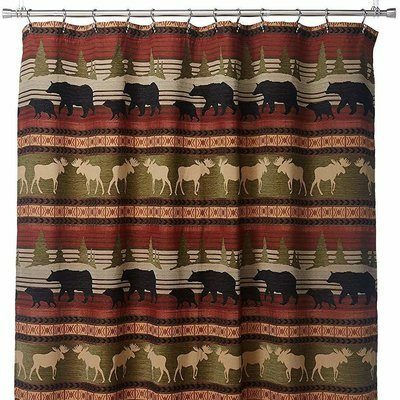 If you would like to use a moose theme in your kitchen or bath, try using tier curtains for those windows. And you’ll find great moose shower curtains to complement your bathroom curtains. Of course you don’t have to use moose exclusively with your rustic wildlife theme décor. You can mix and match the wild animals that you see near your log cabin home. Try using country décor items that feature deer, elk, bears or your favorite wildlife. Who might use moose in their rustic décor? Certainly hunters who enjoy the outdoors. But this theme is not limited to hunters. Anyone who loves the majestic look of moose in the wild will enjoy having a glimpse of these magnificent beasts—every time you walk into one of your rooms. Who has seen a moose and not marveled at their huge size and their presence? Even if you’ve never seen one in person, you’ll love having them in your cabin or lodge! Pine cone curtains are very versatile and can be used with other rustic themed décor like wildlife themes, deer, moose, bear, or fish. Pine cone window treatments can be used to bridge other themes. They can pull together outdoor themes and help to bring Nature indoors. 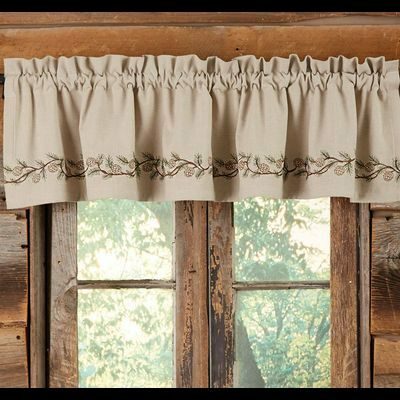 You will find pinecone valances, tiers, and full length curtains, and they come in different weights of fabric, making them suitable for every room in your log cabin home. Pine cones and pine trees remind us of the north—the North Woods and areas that have pine trees growing wild in the forests. But they also remind us of mountain lodges and cabins by the lake. One nice thing about using a pine theme is that it doesn’t have to be the only theme that you use. Trees are found in the same places that animals are found, and they are complementary themes when decorating your home. For example, if you have a cabin by a lake, you might use bears and pine cones as themes for each room. Or fish and pine cones. Pine cones and trees are sort of a mix and match with other motifs. Consider combining a plain colored curtain or a curtain with a small plaid, with a cute tree or pine cone valance. The window valance may be just enough of an accent, to highlight your window without becoming busy or overpowering. Pine cone window treatments have a place in rustic décor, and they work well with most themes, including those that are used in timber lodges, log homes, lakeside cabins and mountain estates. Rustic window treatments with deer go well with other outdoor themes like moose, bear, pine cones and pine trees, elk and even ducks and dogs. 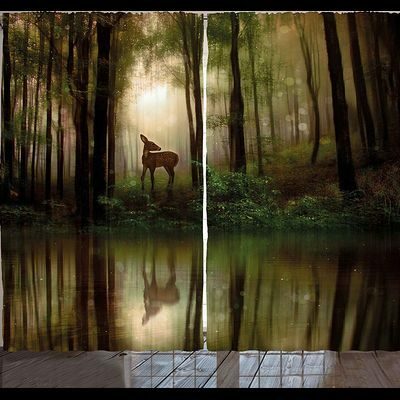 Deer animal print curtains fit in nicely with other wildlife themes, and you don’t have to have everything “deer”. Deer are one of the most commonly seen animals in the wild, and featuring deer on your curtains for windows in your living area, dining area, bedroom or bath is one of the ways that you can bring the outdoors (or at least the feeling of being outdoors) into your home! Hunters and wildlife watchers alike, enjoy seeing deer outdoors, and using a deer theme in your country cabin or lodge just makes sense. Of course, if you prefer, you can have everything reflect this noble animal. There are deer products available in rugs, shower curtains, wall hangings, and even lighting. You can have as much or as little deer as you want, in your décor. 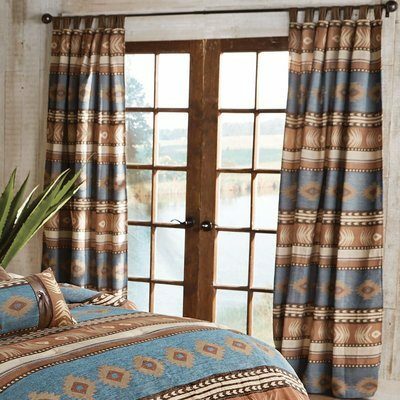 Western curtains or horse curtains look great in a timber frame ranch home or lodge. Using common western motifs like horses, stars, cowboy boots, cowboy hats, sheriff’s badges and old time pistols give your home the feeling of being in the Old (or newer) West. 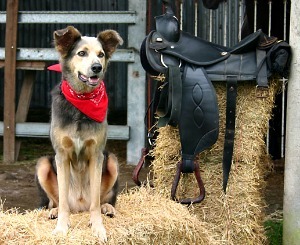 Using a western theme for your home décor, gives it a casual and very practical look and feel. Western curtains and drapes often use lined fabrics or heavy fabrics like damask, faux leather, canvas, muslin, velvet, or ultra-suede. Western window treatments work well in a home where everyone loves horses! The key to decorating with a western theme is to keep things casual and comfortable. Consider what your family and guests will enjoy after a hard day’s work on the ranch (or after a fun afternoon of horseback riding), and keep things simple. 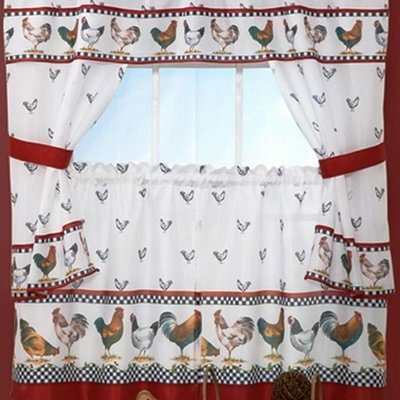 As with all country curtains, you’ll want to consider the maintenance issues. Curtains that are easy to vacuum and keep clean are the most practical. And those that can be thrown into the washing machine are even better. And, lastly, if you don’t live on your country ranch yet, you might want to decorate your little cowboy or cowgirl wannabees’ rooms with horses and cowboy hats, and call it a “happy trails” day. Nautical window treatments add interest to your windows, whether you have a permanent seaside home or a weekend cottage by the lake. In addition, if you just love the water, you can decorate one or more of your rooms with a nautical theme—giving you the feeling of being on vacation and near the water, all year round. Ocean front cottages often have a light, bright feeling, with lots of breezes. To preserve that feeling, choose curtains for windows that are made of lighter fabrics, like cottons or sheers. Part of the enchantment of nautical curtains is their blowing in the breezes off the ocean. If you live right by the sea and have lovely views, consider using decorative fabric valances. Valances soften the look of your windows, yet they don’t block the view. 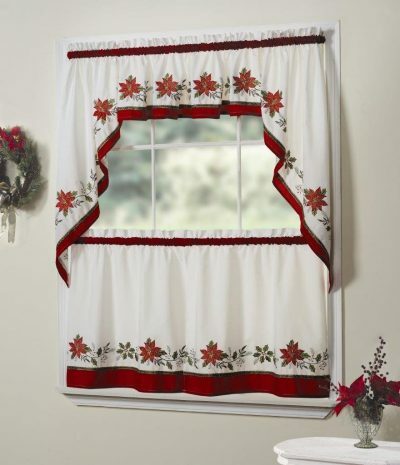 There are some adorable embroidered valances available. And they are so affordable! 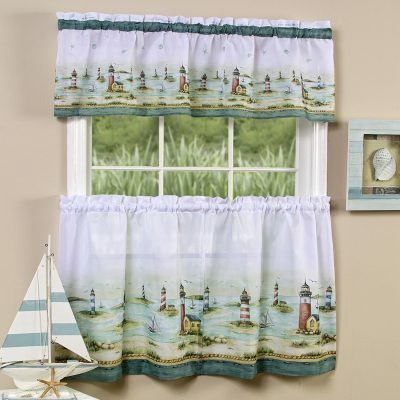 Nautical theme curtains can feature lighthouses, fish, beach scenes, seashells, sea horses, boat (steering) wheels and just about anything else that you may see or enjoy when you visit or live by the sea. You can pick and choose your motifs, and there are so many available, that deciding what to use can be lots of fun. Consider decorating your bathroom with a nautical theme, even if you don’t use the same theme in other rooms of your home. Or why not use nautical decor items just for the summer months? Country curtains and shower curtains are quite affordable, and changing your cottage or cabin décor for the different seasons is a great way to give your home a fresh look for each season.